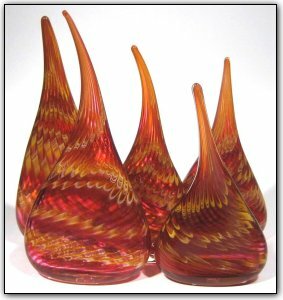 This 5 piece set of sculptures features various shades of very deep pink and gold topaz. The largest one is 13" tall and measures 6.5" x 2.75" at the base, and the smallest one is 10" tall and measures 5.5 x 2.75" at the base. The patterns on the sculptures are very intricate so make sure to zoom in and take a close look!